The agrifood sector is one of Québec’s largest industries. It contributes to the provincial economy by generating close to $7.5 billion in direct benefits and providing jobs to more than 174,000 people. This important sector is currently grappling with a range of challenges and obstacles: supplying local and global markets, water scarcity, issues related to the security, quality and nutritional value of food and diseases, parasites and insects that threaten livestock and crops. Genomics is a powerful tool that can successfully address these problems. It can, for instance, decipher complete genomes in record time at increasingly affordable costs. Genomics is having a major impact on crops and breeding but also in biology and human health. 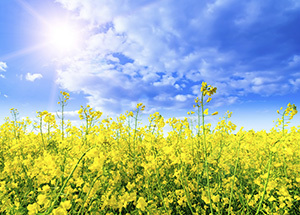 Economic activities linked to canola and its derivatives have been evaluated at nearly $14 billion in Canada alone (2008). At McGill University, a research team headed by professor Thomas Bureau is using genomics to identify, characterize and validate the DNA regions that determine important features for canola crops, such as their ability to resist frost, drought and pathogens. The result of this work will lead to the development of DNA markers that can be selected to enhance the performance of canola seed, which will improve crop productivity and generate greater economic benefits. Boosting the per-hectare productivity of land will, of course, have a positive impact on the sector’s farmers and food processors by driving down the cost of food production in the future. In addition, the benefits of Professor Bureau’s research will reach beyond canola crops, since the DNA markers can be used to improve other similar crops, such as cabbage and turnip. Develop crops better able to resist growth-inhibiting factors (e.g. : diseases, parasites, frost, drought, floods). Grow food with a higher nutritional value. Improve the digestibility of animal feed. Make tools to facilitate the traceability of food, crops and livestock. Many believe that genomics can do even more! It can offer new avenues that will help us adapt to climate change and feed the 9 billion inhabitants the planet will have in 2050. The aim of these scientific advances is to ensure the greater prosperity of agriculture and open up new prospects for the sustainable development of the sector and a better future for all. The agrifood industry, the largest industrial sector in Québec, has a huge capacity for research. It is a crucial sector from the standpoints of both competitiveness and the well-being of the population. Genomics can contribute to the support and development of this industry to make it a competitive niche of excellence at both the national and international levels. Innovation, backed by research, is the best way for societies to achieve higher standards of living for their citizens, continue their growth and create wealth for redistribution. 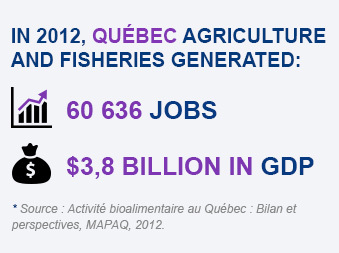 Production and transformation activities in agrifood have a major impact on the Québec economy. In 2007, they generated 174,285 direct, indirect and induced jobs in the province and created direct, indirect and induced wealth (GDP) totalling $13 billion. In addition, the activities of this industry generated $3.9 billion in tax revenue and incidental taxes - $2.8 billion from transformation and the rest, $1.1 billion, from production. *Source : Étude de Maurice Doyon, professeur au département d’économie agroalimentaire à l’Université Laval, préparée pour l’Union des producteurs agricoles, 2009. The global population is growing at a dizzying pace. By 2050, the Earth will be home to 9 billion human beings. The main challenge facing the agrifood industry is providing each of them with safe, tasty and nutritious food produced in a manner that respects the environment. Source: La Presse, November 11, 2009, “L’agriculture est une industrie rentable au Québec,” Philippe Mercure, Summary of l’Étude de Maurice Doyon, Professor, Department of agrifood economy, Université Laval, prepared for the Union des producteurs agricoles, 2009.